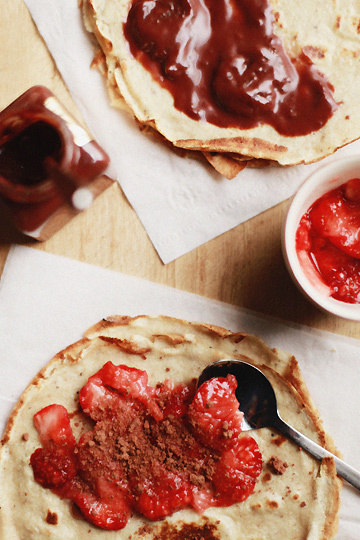 she who eats: crepe or pancake - whichever. crepe or pancake - whichever. What day is it today? How do you call it? Fat Tuesday? Mardi Gras? Shrove Tuesday? To me, it's Pancake Day. In many parts of the world people may be eating some sort of pancakes today. Japan is not included here, but I'd personally like to join the celebration by following this food tradition; you may call it just an excuse for me to eat pancakes, and you'd probably be right. But anyways, a pancake to me means a North American pancake (we call them "hotcake" in Japanese), the thick and fluffy sort served with maple syrup, chocolate, whipped cream, and/or fruits. But today I chose to make English pancakes, which are very much like French crepes, just like I did for Pancake Day five years ago. 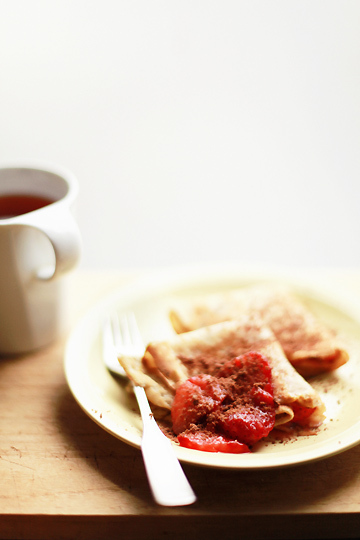 In fact, the last time I fried up crepes myself was that time - five years ago; wow, time really does fly. The main reason for this rather long hiatus in my crepe making is, as I mumbled on that pancake post of five years ago, that I'm crap at making pancakes/crepes. As a kid, I used to produce horrible lumps of flour and eggs with every good intention of making pancakes or crepes, an effort that was never rewarded. To my honor's sake, I'd make oven-baked cakes alright - just never had a good luck around a frying pan. 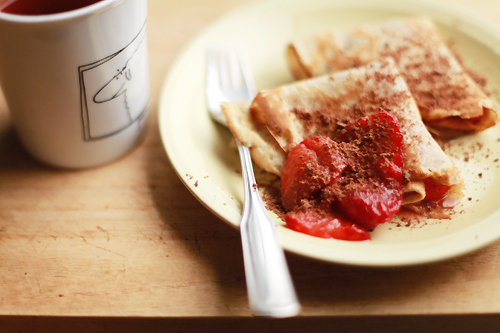 But somehow today (to be precise, last night) it occurred to me to make crepes - so I did. I prepared a buckwheat crepe batter last night (they say it helps to make the batter some time in advance, preferably the day before), and fried crepes today. I wasn't holding my breath to conjure up nice rounds of crepes, honestly; all I was hoping for was to make something I could eat - or actually enjoy, even. And somehow, for some reason I cannot nail down, they came out okay. Very much edible and enjoyable, even. Just imagine how happy I was. I almost cried. Just. These weren't the prettiest crepes you'll find, I know, but they tasted fine. Celebrating my long-yearned success (I call this a success, because my goal in the first place was, simply, to make something edible, you know), I dressed up my crepes with some of the good stuff that I had around: a smear of chocolate & strawberry-mint confiture from el ceibo that I'd bought at Salon du Chocolat Tokyo last month; a heap of lightly crushed fresh strawberries with generous shakes of hazelshock, Italian gianduia granules that are as light as snowflakes and literally melt in your mouth; and a good sprinkle of light brown sugar and a dash of juice of yuzu (not pictured), inspired by the most common/traditional way of serving pancakes in the UK: lemon and sugar. How did I not know today is Shrove Tuesday? I make a note to make crepes Feb 2 (Chandeleur, in France), but another crepe opportunity so soon is definitely worth noting. Dinner plans: check! Thanks for the heads up! What beautiful images to wake up to! I'm drooling over the thought of yuzu and sugar pancakes! It'll be plain sailing from here on in! It's like riding a bike, once you do it, you can do it forever...ooen shitemasu! What recipe did you use for your buckwheat pancakes? They look amazing! Those pancakes look beautiful! You have such a great space here with gorgeous pictures and delicious recipes! i am in awe of your photography chika. dreaming! Sasa - really? you think so?? i hope so, too... gotta get myself practicing! i love crepes and pancakes too! though i don't remember the last time i made either of them.